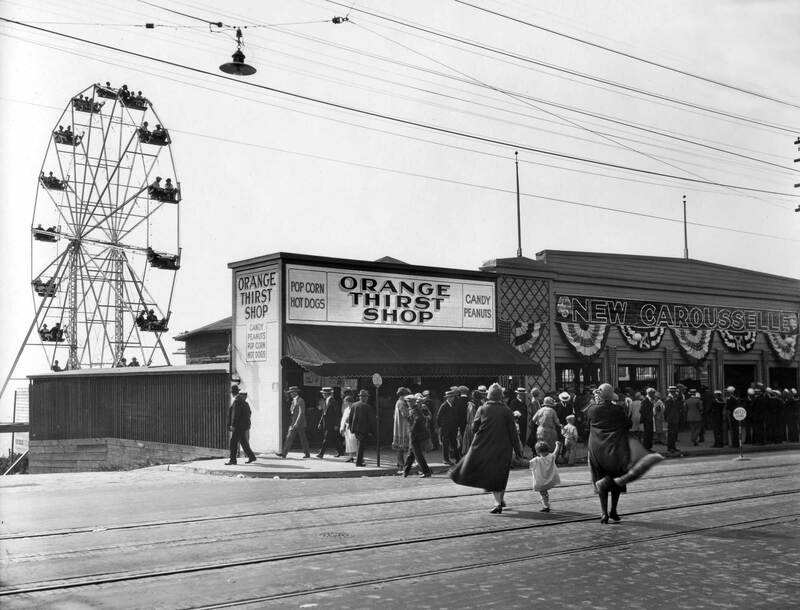 NOW: Lora Hansen moved in 1936 with her parents to a home on Greenwood Ave., across the street from where the Ferris Wheel had stood. She recalls that a children’s playground merry-go-round was set on the concrete slab that once supported the amusement center, until St. John United Lutheran church built their new sanctuary there in 1954-5. Recently while retired U.W. Archivist Rich Berner and I sat side-by-side looking at old photos together in the now old Museum of History and Industry Library, Rich pulled from an archival box this week’s subject and turned it to me. 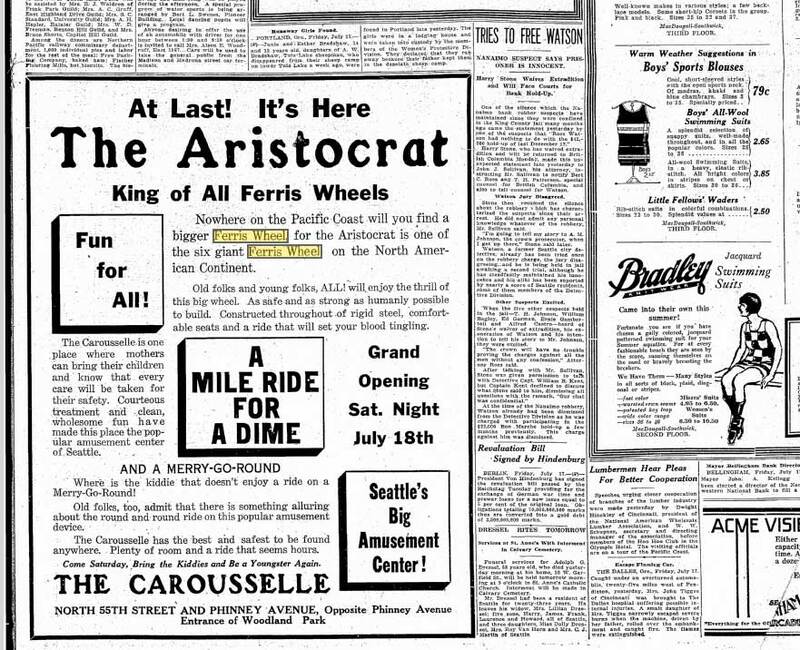 Instantly I felt that happy “Eureka” rush, for here, I was confident, was the Phinney Ridge Ferris wheel described to me long ago by a ridge partisan, who claimed that the big wheel stood across Phinney Ave. from the entrance to Woodland Park. 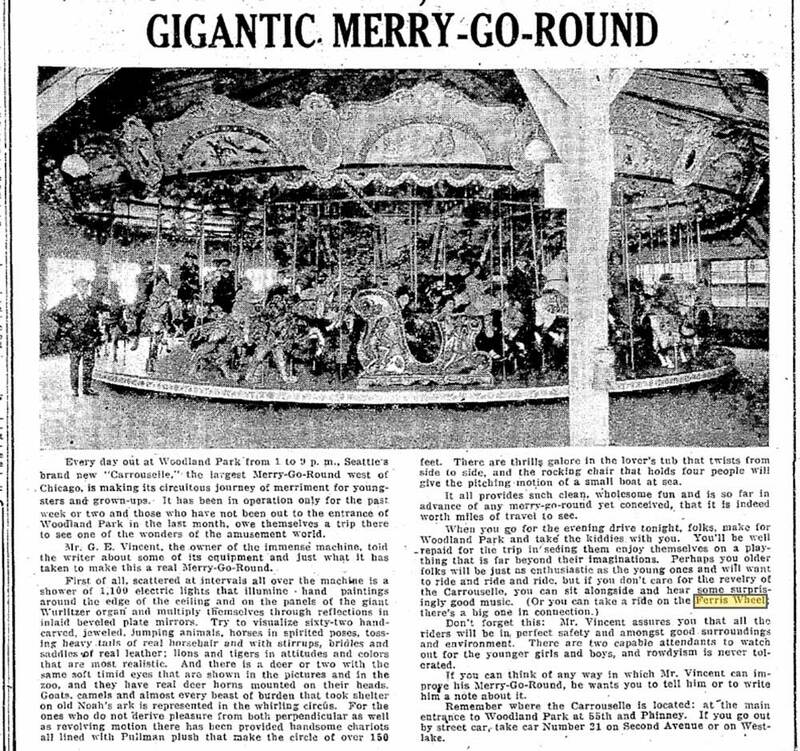 In the spring and early summer of 1925 George and Lucy Vincent installed first the “New Carousselle,” here generously signed above patriotic bunting at the front of their amusement center, and then “the Aristocrat,” which they described as “one of six giant Ferris Wheels on the North American Continent.” Both were, apparently, replacements for the smaller wheels they opened with in 1919 over considerable neighborhood resistance. 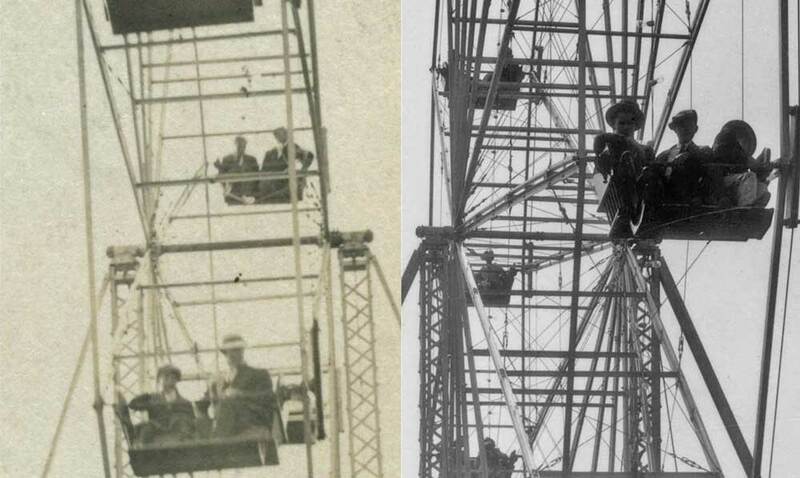 George’s father Robert C. Vincent, age 76, died after a short illness early in 1920, not knowing if his top of the ridge amusements would survive. The son and executor, George, using then a mix of licenses and zoning, the sympathy of friendly neighbors who liked living near these revolving excitements, the clout of free enterprise, the favors of club life, and one restraining order kept the Vincent business in place until the night of August 26-27, 1934 when it caught fire. Consumed was the Carousselle, the 62 hand-carved animals, the one thousand electric lights and the reflecting mirrors. Gone were the skating rink, two lunch rooms, and the transcendent Aristocrat. A few of the neighbors nearest to the ashes of the Carousselle’s mighty Wurlitzer Organ may have given thanks. Just a few Jean, and all from the neighborhood. 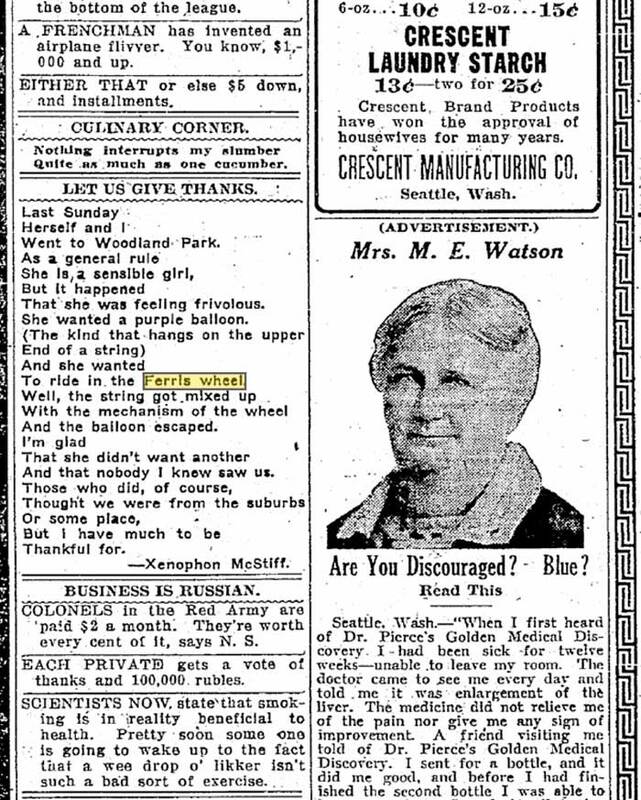 We being with a poem about our Ferris Wheel printed in the Seattle Times for May 11, 1923. By then it was secure in its struggle with a cadre of nervous neighbors. 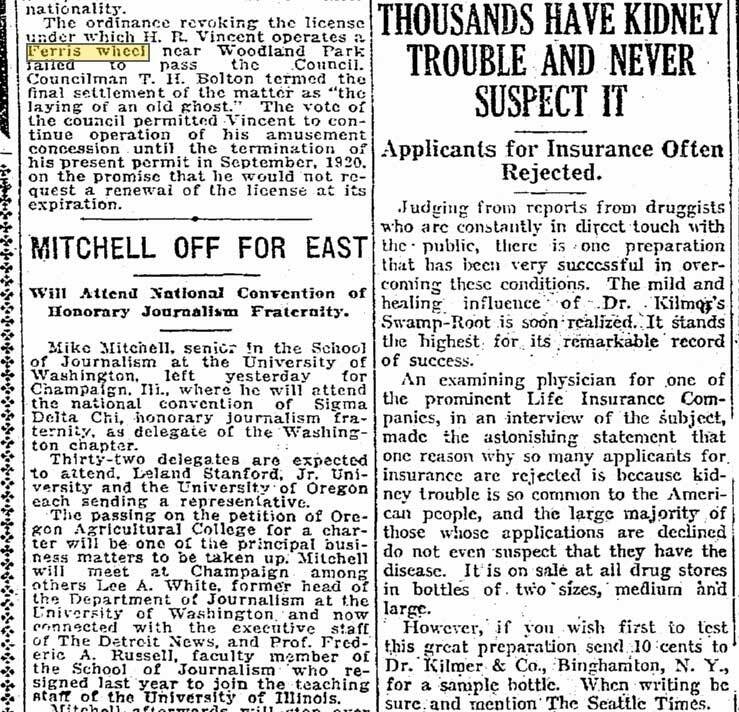 The Times clip dates from May 11, 1923. The caption - hand-written - on the top reads, in part, 1918. And there's the rub or friction. 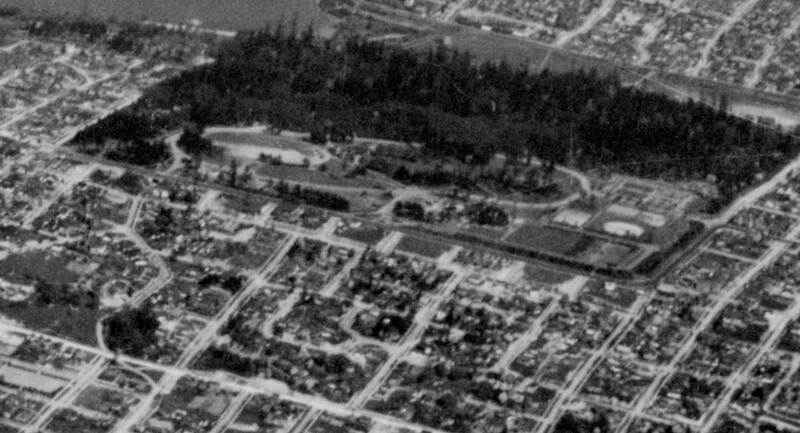 When Ron Edge showed the one above (on the left with a yellow tone) to me some months past it was the first such snapshot to excite me with the possibility that someone had at last come forward with evidence of the remembered Phinney Ridge recreation across Phinney Avenue from the Woodland Park Zoo. Although the photo has its own hand-written caption it does not place the wheel, so my identifying it was a somewhat confident hunch. Later when the two MOHAI negatives of the identified recreation center showed up – with Rich Berner’s help – I went for another delightful fishing expedition into the Seattle Times on-line “key word search” (through the Seattle Public Library who paid for the service for our use – remember to vote for the library) and came up with many clips, some of which are printed below, most in order of the time they were first printed. 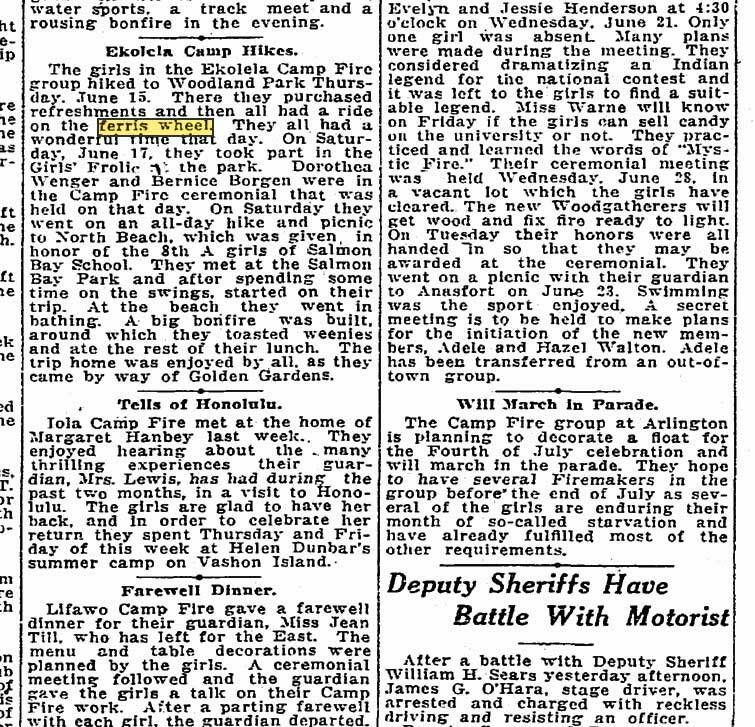 My assembly of the clips began in 1919 with something of a blizzard – nothing about this attraction appeared in the paper, it seems, in 1918. That lack suggested, at least, that the hand-written caption was wrong. 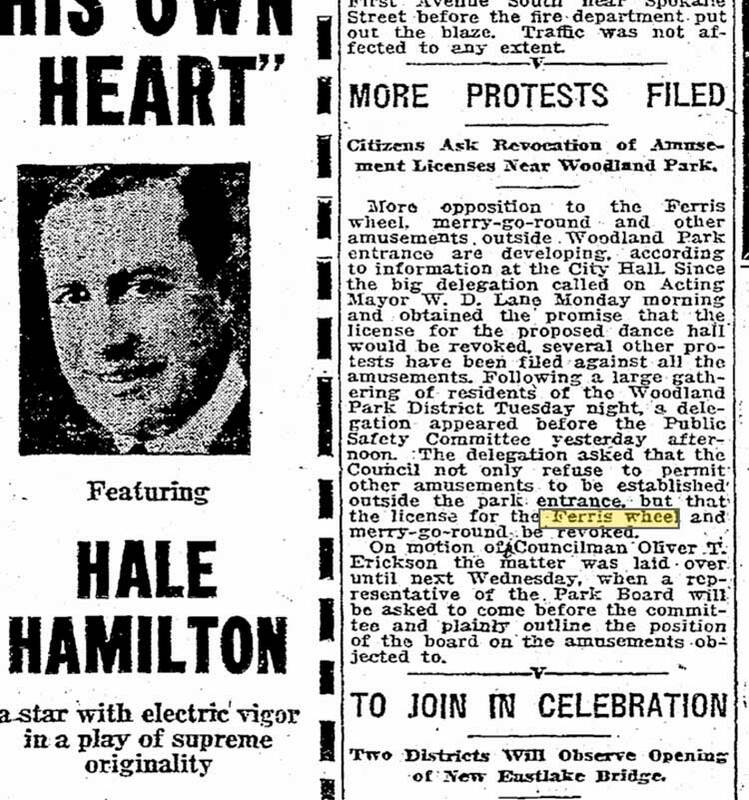 The correct day, I protested, should have been 1919 or some other year in the life of the recreation center (1919-1934) as revealed in the clippings. 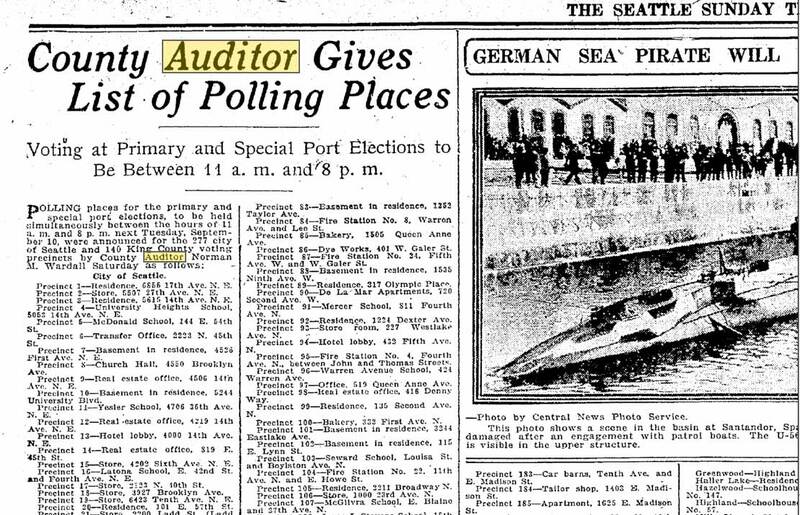 And there was a time-bound clue in the third image – a campaign placard for Elmer Conner, candidate for King County Auditor. Of course, I went key-working for the politicians with a knack for keeping books and came up with confirmation – of sorts – not for my hunch of a mistake in the hand-written caption but of confirmation – of sorts. From this report on the Conner campaign the candidate seems perhaps too passive, perhaps expecting that his good will, contacts and qualifications will carry him to victory without extraordinary effort. 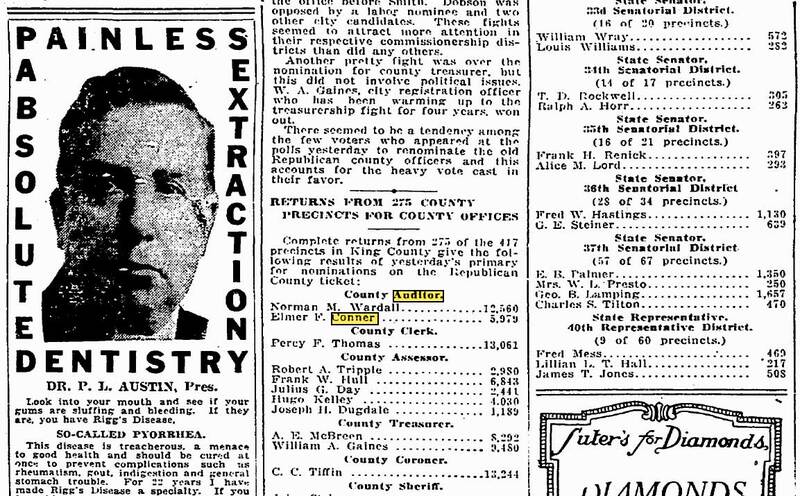 Conner did, indeed, run for county auditor hereabout in 1918 and not in 1919. He lost. He was, after all, running against a popular incumbent, who on the eve of the election had the advantage of announcing over and under his name to every voter in King County where to fine the voting booths in their precincts. One can image Conner reading the “news” below, and feeling deflated. Incumbent auditor Wardall's advantage. 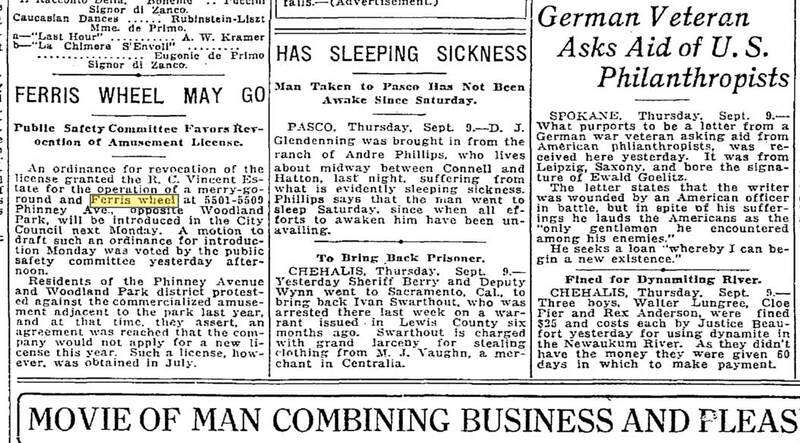 A Seattle Times clip from Sept. 8, 1918. The final vote count - Conner loses in a landside. Seattle Times 9-11-1918. 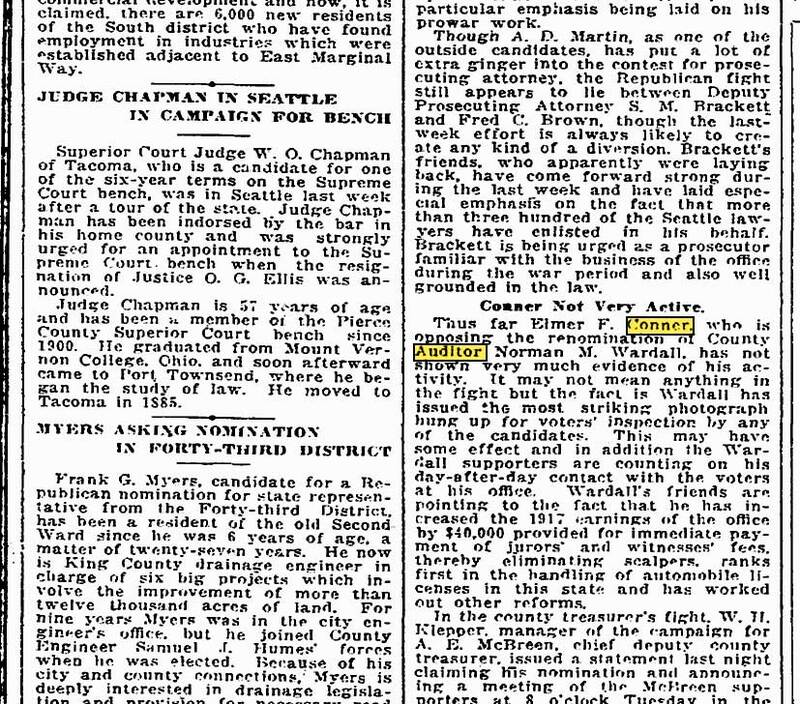 Seattle Times Aug. 22, 1920 news of Elmer Conner's withdrawal from the race. It was back to business and the clubs for Conner. In 1920 he tried again for a while, for he withdrew from the race, and the clip above speculates on why. Conners was a club man and no doubt gregarious and well-connected but not so attached to support that it carried him to public victory. He did have private victories though. Conners was elected to the position of GENERALISSIMO with the Knights Templar, a sub or superset of Masons who dressed up in some sartorial blend or confusion of medieval crusaders and Prussian officers. They liked to show off their badges mixed with crosses – of the Christian sort. The no doubt popular printer was handsome too (on the left, above) - under his plumes especially. Here then is the remaining stream of clips having to do primarily with the 1919 dating of our still holding – somehow – story of the F-Wheel’s birth. Certainly there are other clues available – like in the city clerk’s office – but we have not as yet consulted them. 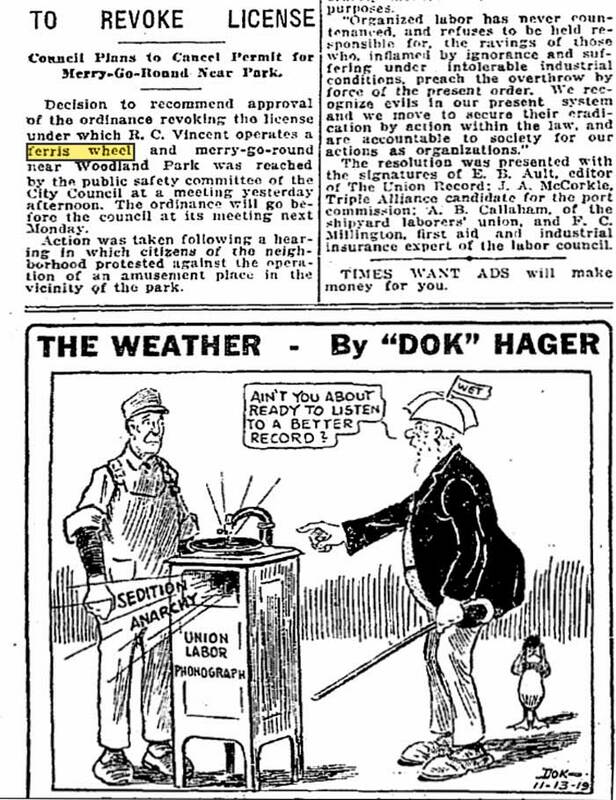 A Nov. 13, 1919 clip indicating trouble for the Wheel and below it some Times political advice late in the year of Seattle's General Strike. City Council derives a short-lived compromise for the Wheel and its neighbors. 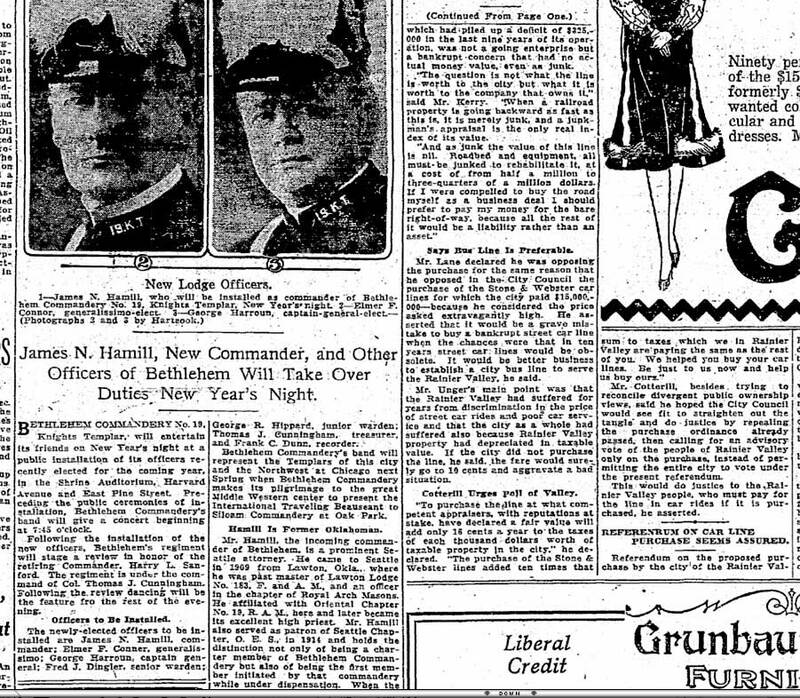 Seattle Times Dec. 2, 1919. 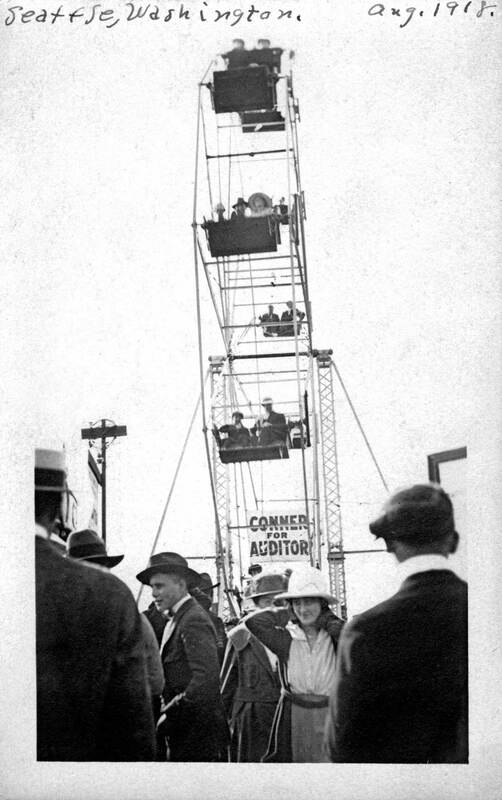 Worries for the Wheel return in the late summer of 1920. Seattle Times Sept. 9, 1920. 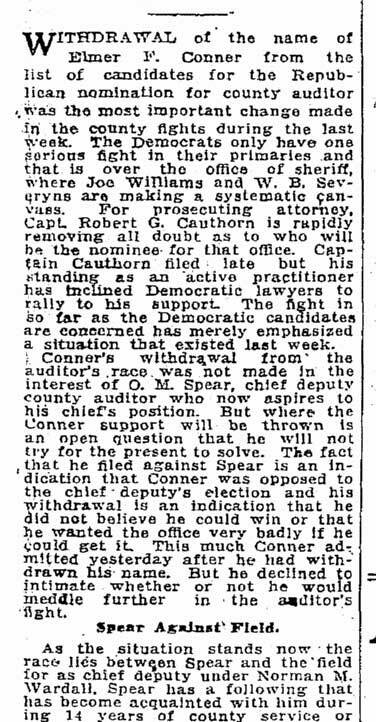 A few days later on Sept. 13, 1920, the Times reports that George Vincent has slapped - or deposited - a restraining order on the city council! Some "good press" for the Wheel. Surely if Camp Fire Girls can enjoy it so, a few neighbors can learn to love the Wheel as well. Seattle Times July 2, 1922. An adver for both wheels from The Times for July 17, 1925. 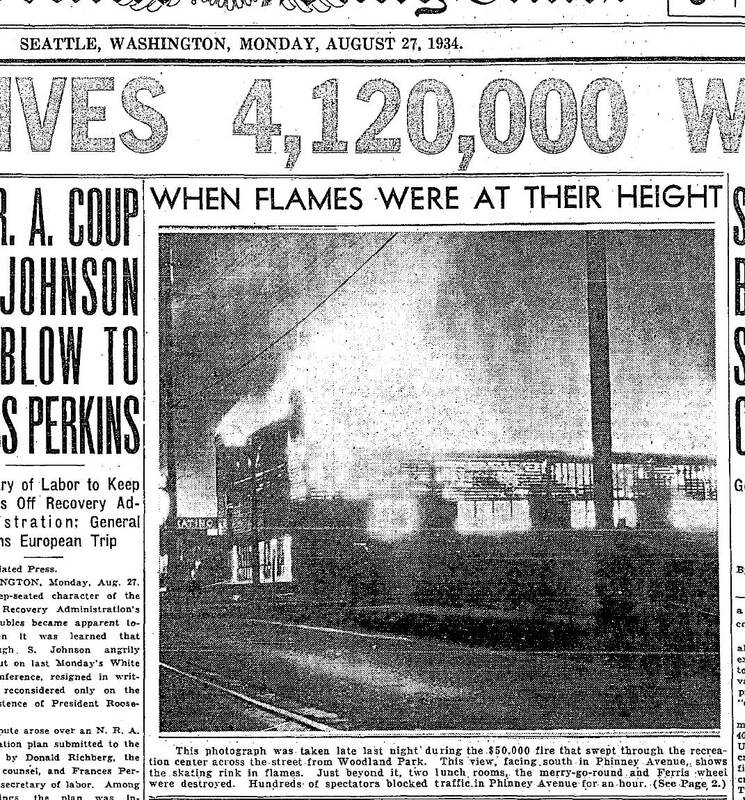 The Seattle Times Aug. 27, 1934 coverage of the corner's big fire. 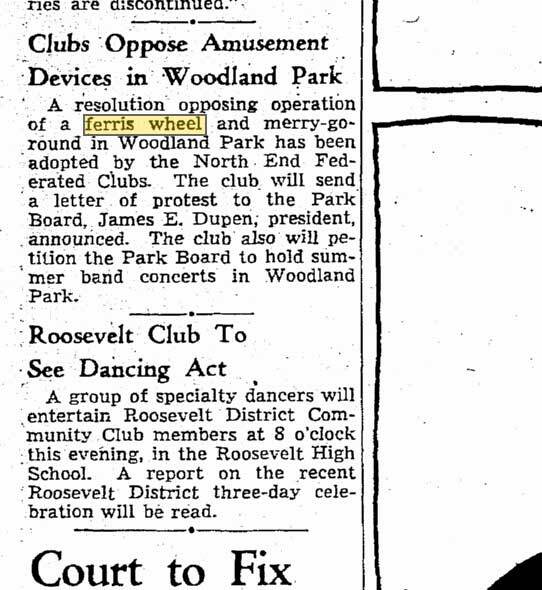 The Dec. 11, 1934 Seattle Times clip has a misleading header. The story describes three City Council actions concerning zoning. Only the first and third noted were turned down. The remaining rezoning was passed. It returned the corner "of the two wheels" and more, to its original residential disposition. The complaining neighbors - those that survived the about 15 years with the excitement - were back to their perhaps eventually nostalgic repose. Eternal vigilance is the price for silent nights on Phinney Ridge. 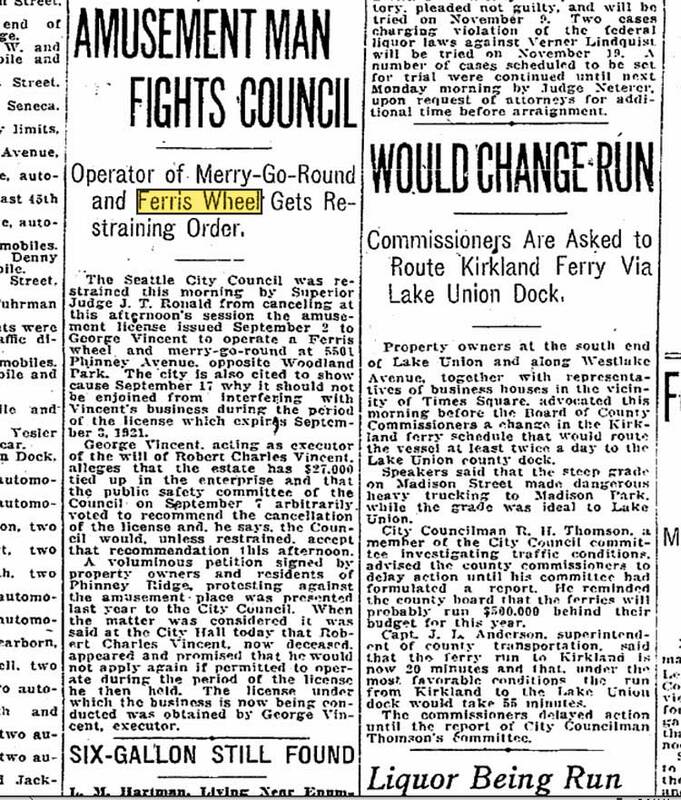 The Seattle Times for May 23,1940, reports on what seems to be a new attempt to put something more than a kiddie wheel in Woodland Park itself and the guardian neighbors response. Follows now a few past features pulled for Pacific from the neighborhood near Woodland Park – or in it. And yet the first shown was never used in the paper (by me). 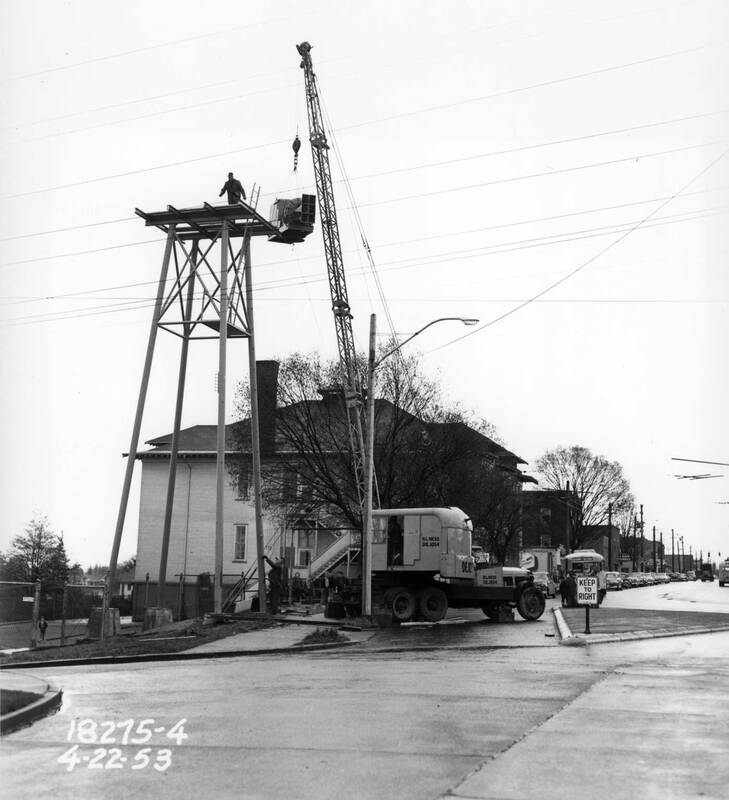 It is a symbol too of mutual destruction insanity – a tower for an air raid siren on the southeast corner of Phinney Ave. and 67th Street. Allen School is behind it and the date, April 22, 1953, is printed bottom-left on the Municipal Archive’s negative. When first I saw this tower I wondered if it was, perhaps, the tower remembered by my ancient informers as a Ferris Wheel. 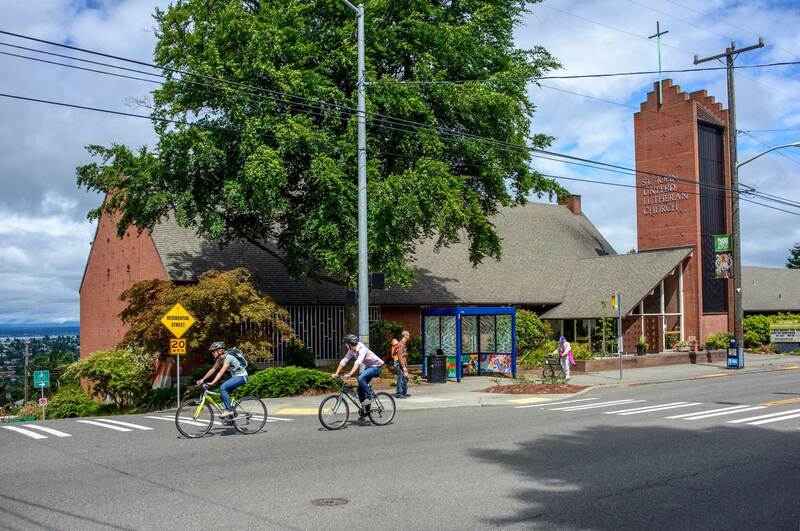 In the 23 years since the Phinney Neighborhood Association moved in, Allen School has prospered as one of Seattle’s community centers. 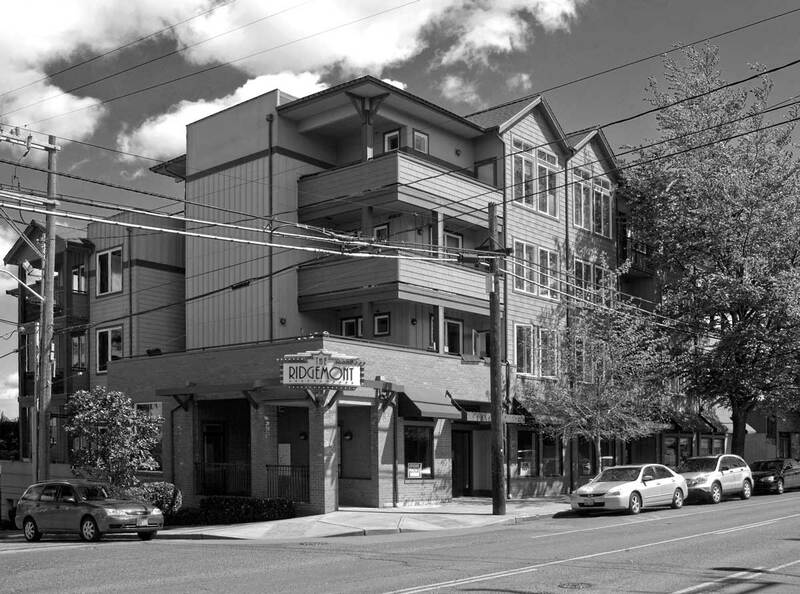 The Association uses both of the old Allen school buildings: the lower brick one and the upper 8-room wooden box that this year has snuggled at the corner of Phinney Avenue and 67th Street for one hundred years. 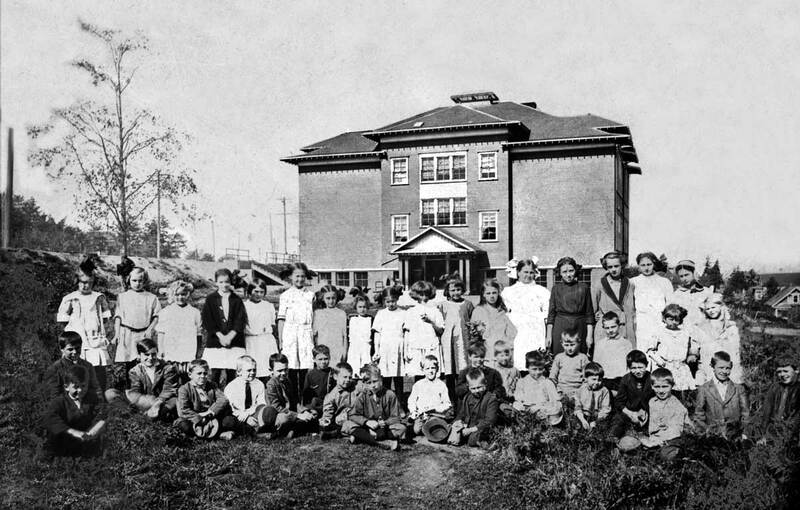 If it is dated correctly this historical scene of Allen School was photographed either during or soon after the construction of the new brick school (out of the frame to the right) in 1918. 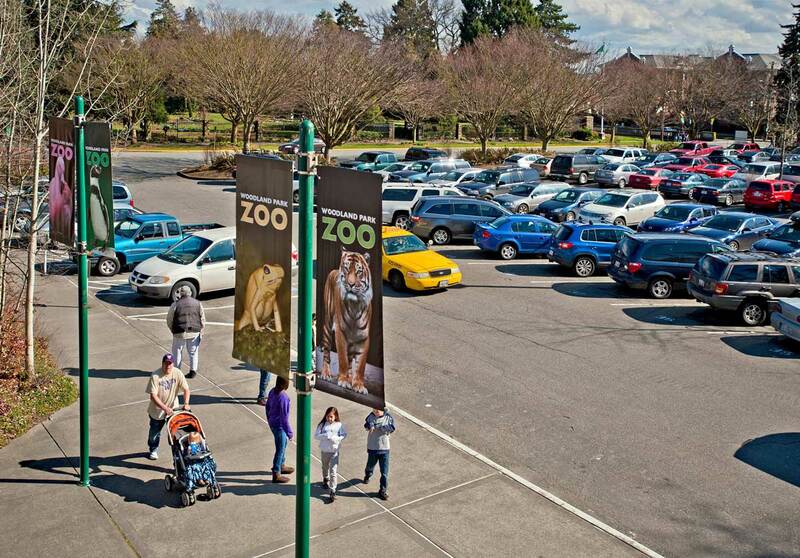 It is one of several school photographs that have been informally collected by the Phinney Neighborhood Association. Many of these scenes – including this one — will be on display during the old school’s centennial. For instance those attending will find photographs of the 1953 installation of the civil defense siren tower that is still a fixture – and for some a puzzling one – at the old school’s corner. Greenwood Firehouse No 21 at Greenwood Ave. N. and N. 73rd Street is an example of the several box facilities that were built for the fire department in the early 1900s. 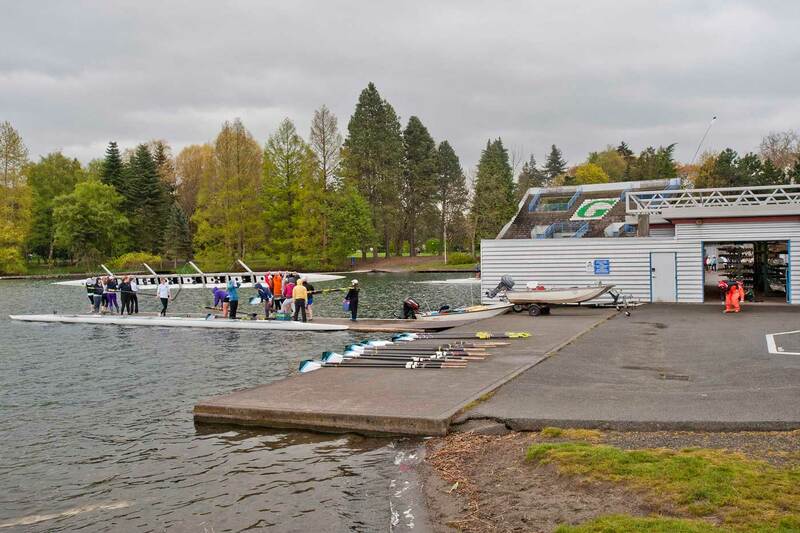 While the modern facility that replaced the it in the early 1950s was more efficient it lent the Phinney neighborhood none of the elegant gravitas of the old wooden box. Historical photo courtesy Phinney Neighborhood Association. 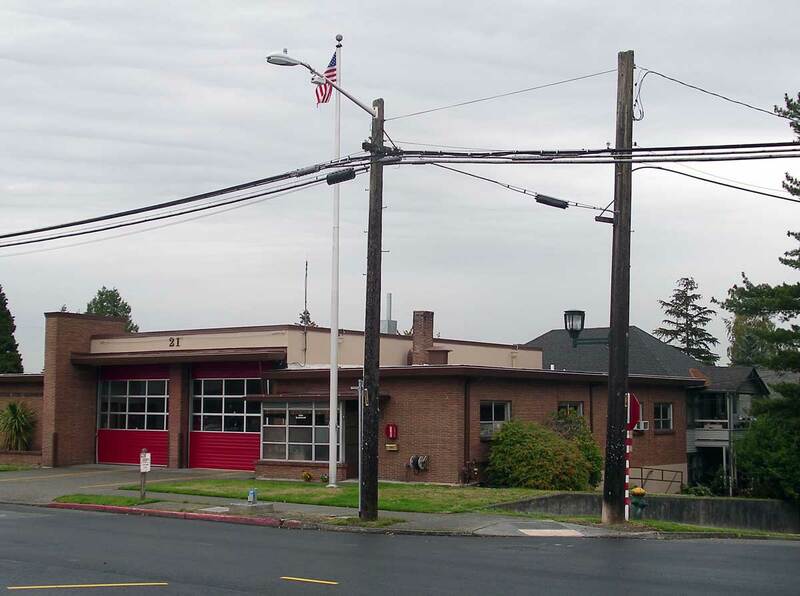 After the Seattle Fire Department’s unfortunate response to the city’s “Great Fire” of 1889 the city learned a lesson and immediately set about building a handful of new firehouses. The first of these were up already in 1890 and all of them showed considerable architectural flare, with curving towers, grand gables and meandering rooflines, fanciful doors and several different sidings in the same structure. 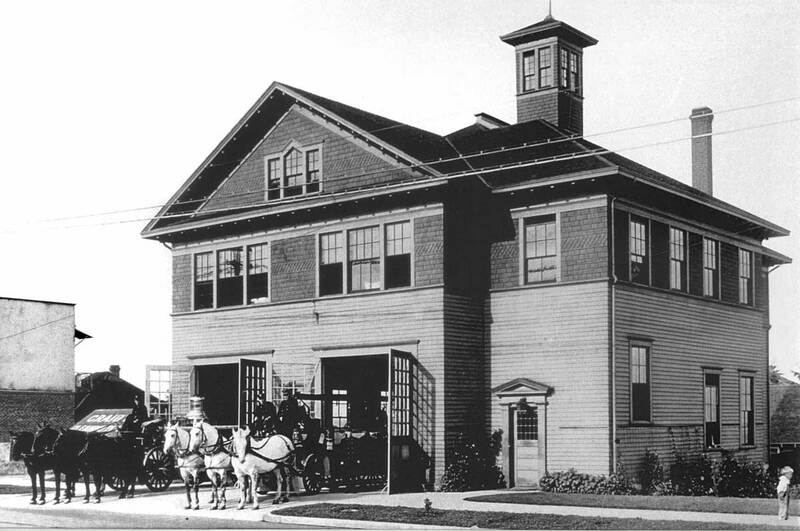 Then in the early 20th century came what Jim Stevenson in his book “Seattle Firehouses” describes as the “standard style.” With an ever-growing need for fire protection in a booming city the additions were “plain, boxy houses . . . uniform in size, materials and plan and usually without decoration.” Greenwood’s Firehouse No. 21 is an example in which the standard big box has had a wing – one the right – added to it. There is also considerable variation in the windows, and siding with this box. Firehouse No. 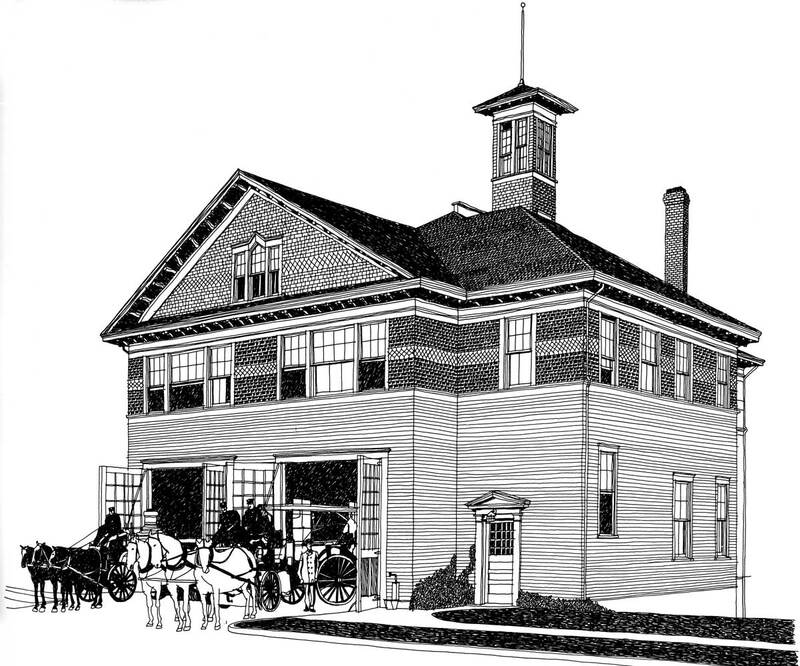 21 pulled from Jim Stevenson's 1972 book "Seattle Firehouses, of the Horse Drawn and Early Motor Era." Firehouse No. 21 opened here at the northeast corner of 73rd Street and Greenwood Avenue in 1908 and for 14 years bedded six horses until a tractorized steamer and a motor hose wagon replaced them in 1922. While the new apparatus could respond more quickly to neighborhood emergencies the old ways were not without their ingenuity. When the horses were still galloping from these big doors they were first speedily hooked to their wagons with harnesses hung from pulleys on the ceiling. This view appears in this year’s Greenwood-Piney Calendar, a production of the ever-vital Phinney Neighborhood Center. 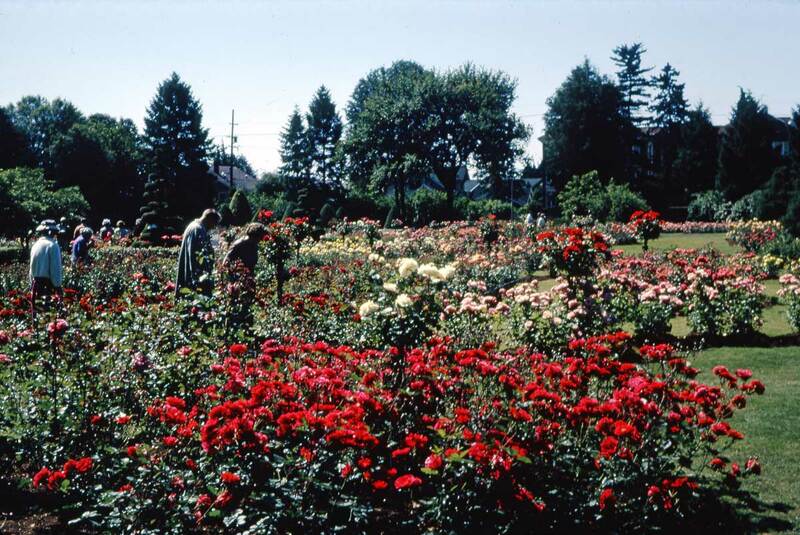 Purchase a calendar (at $10 each they are available at several Greenwood neighborhood businesses, as well at the Center itself at 6532 Phinney Ave. N.) and see the other eleven photos plus a 1912 map of the Greenwood-Phinney neighborhood. Some people roll them up and put them in sox. 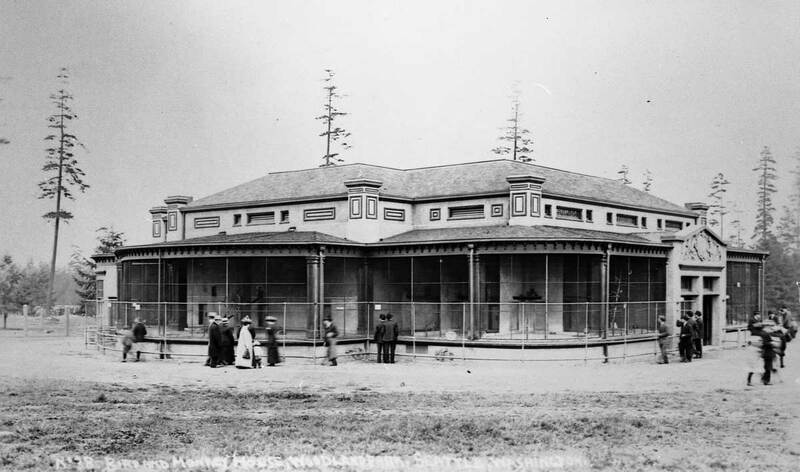 The photographer of this satisfying record of Guy Phinney’s Woodland Park Green House is unidentified because although she or he signed the negative at its bottom-right corner, someone’s fingerprint sooner or later smudged it beyond recognition. The early view (ca. 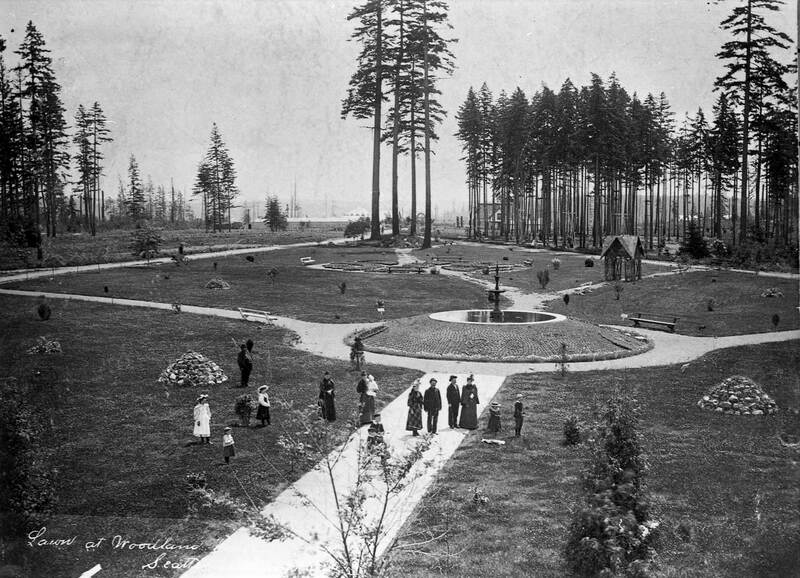 1890) looks east-southeast across the park’s extension of Fremont Avenue. For his repeat Jean Sherrard moved a few feet to the west of the historical prospect in order to include samples of the illustrated banners that now decorate the entrance to the zoo. Jean used his extension pole to approximate the elevation of the historical view, which was photographed somehow from the roof of the well-wrought stone home in which the Phinney family was temporarily living at this entrance to their big country estate. The Phinney family shared the park with that part of the pubic that obeyed park rules. Out of frame to the right was a grand granite arch with “Woodland Park” chiseled across it and next to it a large sign posting the commandments. These included prescriptions against dogs, guns, spitting, swearing, drinking, picking the flowers, and teasing the animals in the Phinney’s small zoo. The stars were one bear and two ostriches, caged but not together. 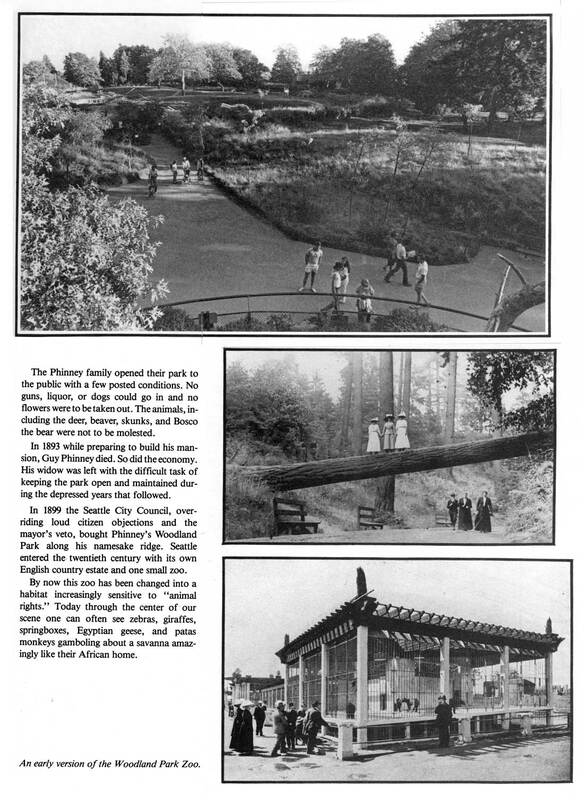 The Phinney’s grand plans for their park, including a mansion for the family, were stopped with the father’s sudden death in 1893. 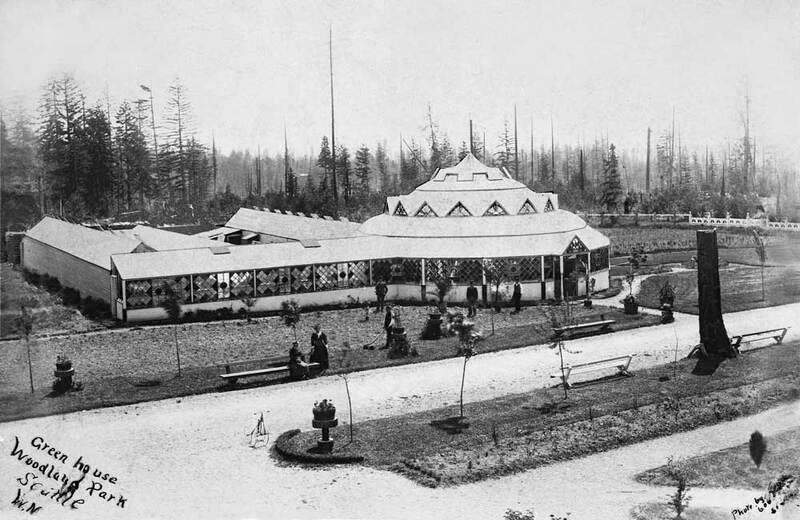 In 1899 the prudent city council overruled the mayor’s veto and purchased the park for “future generations.” The green house, which was used to nurture starters for landscaping in other city parks, was succeeded in 1912 by Volunteer Park’s new plant conservatory, and Phinney’s charming glass house for plants was sacrificed for what later, with the activism of the Seattle Rose Society, became Woodland Park’s prized Rose Garden. 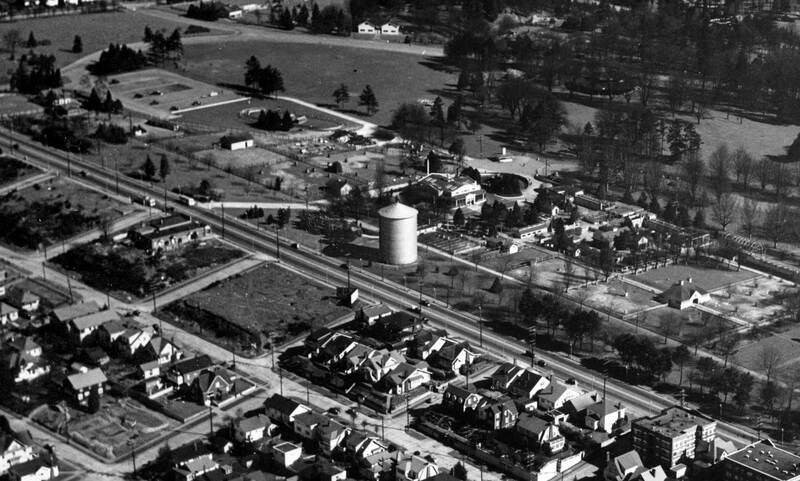 A detail of an aerial dated April 7, 1946 and contributed - again - by Ron Edge. Find the monkey house right of the water tower. The light-colored road that turns left of the water tower leads to Phinney Avenue at 55th Avenue, formerly the site of the entertainment attractions revealed above - the 2-Wheels. Yet another aerial from Ron Edge, this one dated 1926. Although the quality of this early sky shot is slight the less developed qualities of the park or still evident. There is still, for instance, not Aurora Speedway cut through it. The corner with the 2-Wheels is there, but can you find it? Count five blocks north of 50th Street, the southern border of the park. The view looks to the northeast. A third aerial courtesy of Ron Edge. This one looks southeast and is dated April 25, 1947. It is elaborate but regular evidence of the efficient conformities, both public and private, embraced by any "main chance" boom town like or nearly like Seattle. The southwest corner of Woodland Park is evident upper-left. The now-then comparison below followed a variety of study that is often enough used by Jean and I to find our mark. We have employed here a combination of Google Earth and the 1912 Baist Map that is included with this blog. And often we use supporting photos - one's from different angles too - too, but not here. Looking to part of a Follies show from the lowest row of Aqua Theatre seats, ca. 1951. 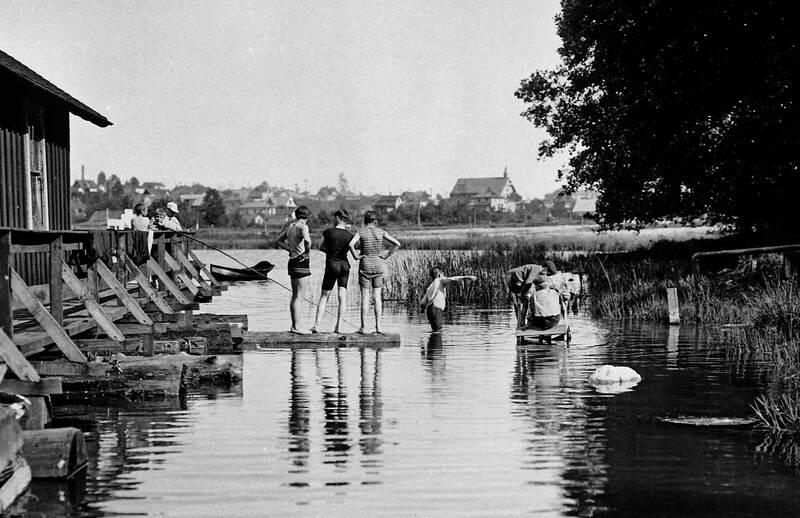 This Green Lake tableau looks south over the shoulders of young boys enjoying the eternity of a summer day at the southwest corner of the lake. The likely year is 1908 or perhaps ’09. On the horizon is the nearly new Wallingford sanctuary for St. Benedict parish, which was dedicated in September 1907. 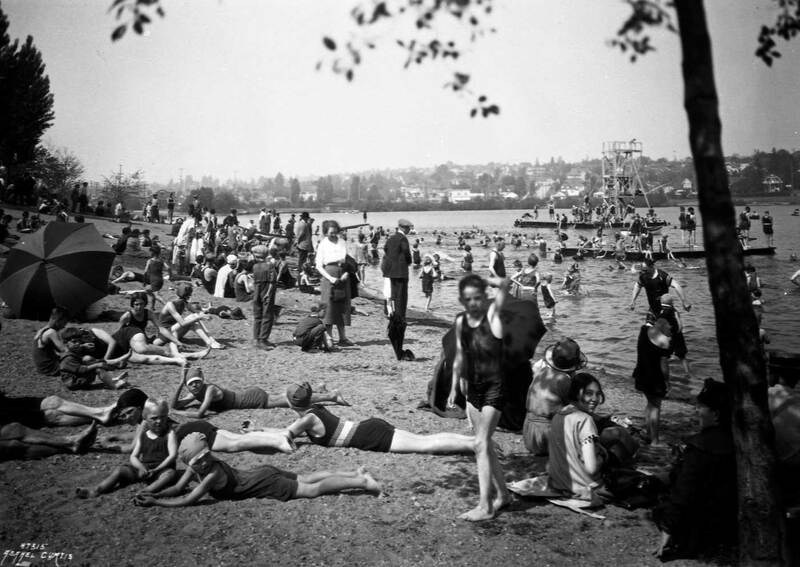 This south end of Green Lake was first reached from Lake Union by a wagon trail in the late 1880s, and soon after by an electric trolley. The streetcars completed their run along the east and north shores of Green Lake on the grade of a logging railroad that had helped clear-cut all the Green Lake neighborhood except this Woodland Park part of it, then still a country retreat for the Guy Phinney family. 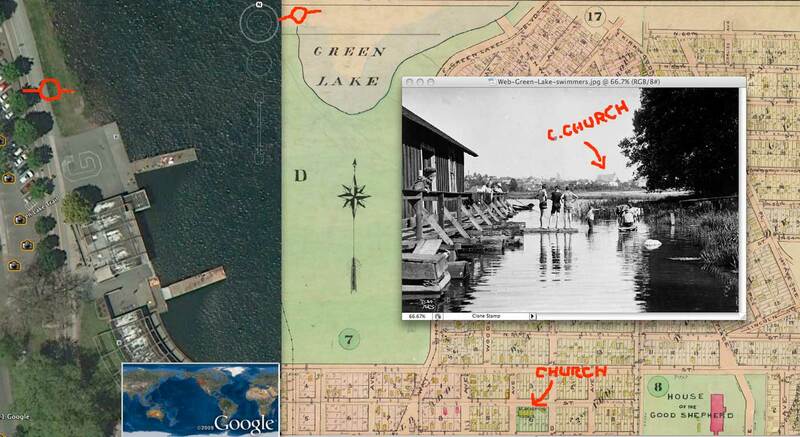 Green Lake was lowered seven feet in 1911 in order to create the park that now rings the lake. 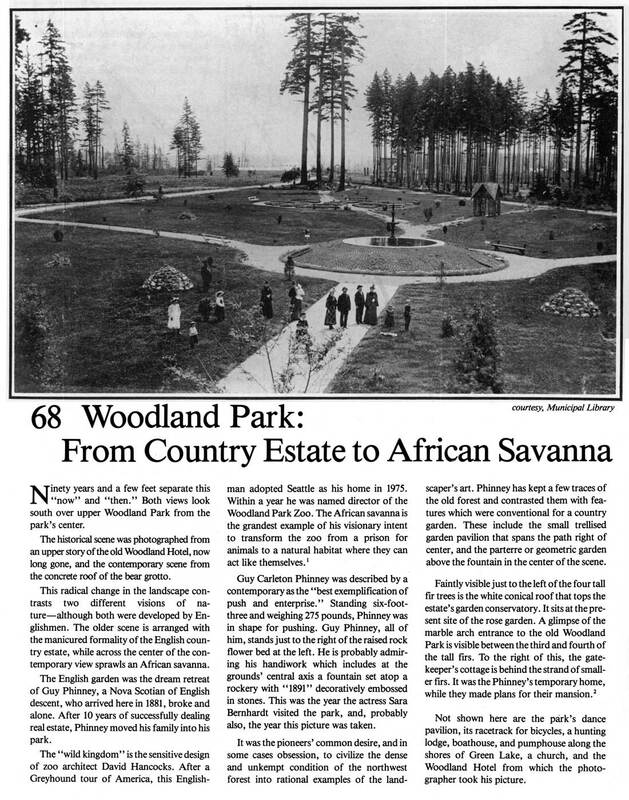 In Seattle Parks historian Don Sherwood’s hand-written manuscript for Woodland Park it is described as including “the first major playfield, swim beach, boating and fishing facility to come under the jurisdiction of the Park Department.” In the century between this “now and then” the park acres (for both Green Lake and Woodland parks) nearby this scene have also been appointed for track and field, soccer, baseball, golf (the pitch and putt variety), lawn bowling, horseshoes, tennis, soapbox racing, and skateboarding. For this southwest corner of the lake the most consequential park development was one that did not happen – here. 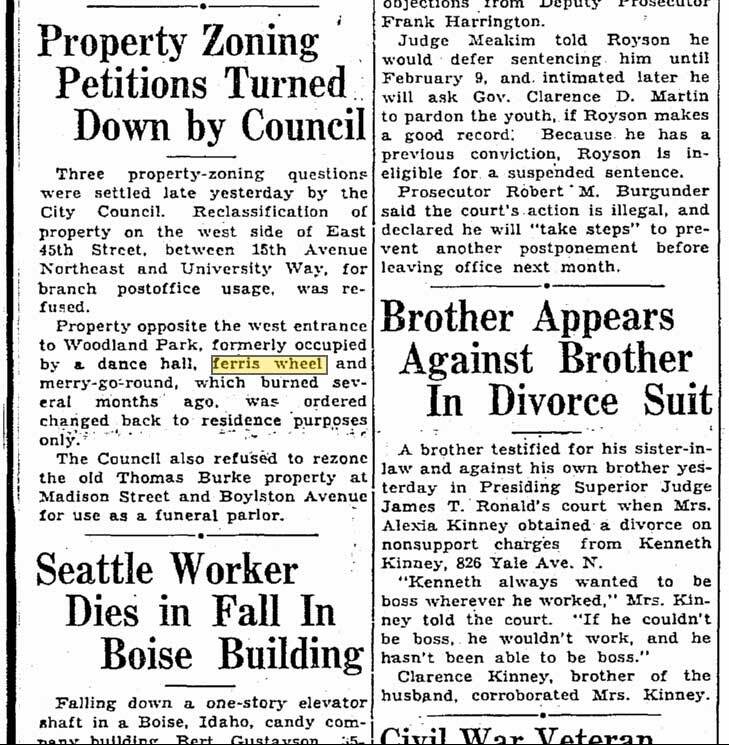 Despite the vigorous objections of, it seems, most Seattle citizens and this newspaper too, the 1932 extension of the Aurora Speedway (Highway 99) was cut directly through Woodland Park. The alternative would have directed the north-south traffic linked to the Aurora Bridge in a detour along Stone Way and the west shore of Green Lake, and so directly thru this scene. Finding the contemporary prospect for this ca. 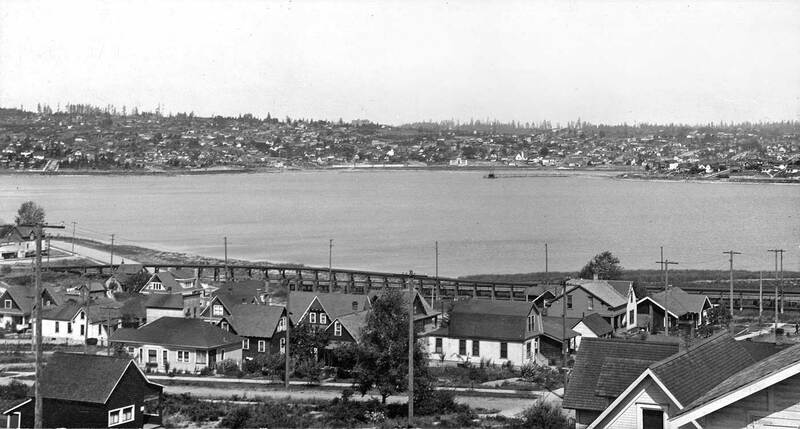 1913 look over Green Lake from Phinney Ridge was, of course, not particularly difficult. Taking the “now” photo was. So to avoid the sightline inhibitions of nearly a century of vigorous growth Jean Sherrard moved away from the trees and onto the sidewalk. Mounting his camera on a ten-foot pole and lifting his arms high his repeat looks east on N. 63rd Street to its intersection with Fremont Avenue. One small example is the white residence with the dark shingle roof that appears just to the right of the power pole that ascends from the center of the frame at the bottom. Only the top of it’s snow-defined roof can be seen in Sherrard’s “now.” The rest is hidden behind the newer and larger bungalow on the northeast corner N. 63rd and Fremont Avenue. The brilliance of the little home at 706 N. 63rd Street is deceptive. It is only twenty feet wide and about twice as long. Trusting for the moment the tax records it was built in 1907, and so may still be celebrating its centennial. I will tell you from standing before it that this snug barn-shaped home is wonderfully charming. In 1911 the Park Department lowered Green Lake by seven feet and thereby added 100 acres to the beach for the development of our encircling park with well-pounded paths. Note the exposed trolley trestle that crosses much of the scene near the shore. Since 1911 it is high and dry. And on the far west shore other trestles and dikes are hinted. They are part of the park-creating public work. 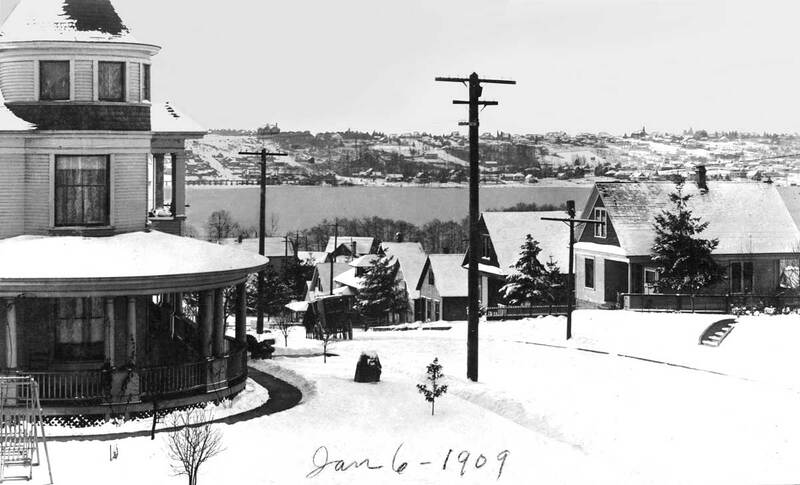 Above: Photographer M. L. Oakes “real photo” postcard looks from Corliss Avenue west on 62nd Street towards Green Lake during the week-long “cold snap” of 1909. (Photo courtesy John Cooper) Below: Jean used a ten-foot pole – and his 6 feet 6 inch frame – to lift his camera to the point-of-view Oakes took more easily from a neighbor’s second floor window. Jean’s “now” was photographed at noon on Jan 16th 2006. 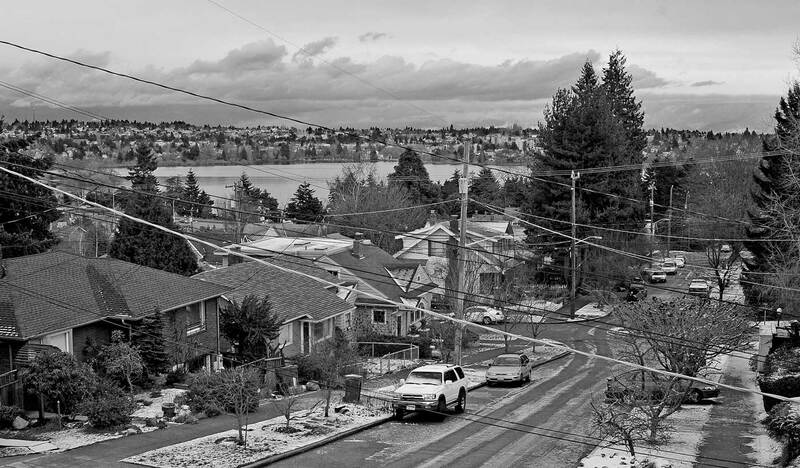 This Wednesday view looks west towards Green Lake and the Phinney Ridge horizon through the southwest corner of Corliss Avenue and 62nd Street. The stately home on the left takes advantage of its corner setting with a tower and a wrapping front porch. The home is listed in the 1905 assessment roles but not in those from 1900, so it is here somewhat new and perhaps very new. In both 1905 and 1910 Alice Leroy George is listed as the owner, but it is George A. Kelly who is paying the taxes, and Kelly is also listed as the resident at late as 1911 – but not in 1912. So here in 1909 this is probably the Kelly home. Early the next morning, Thursday, the temperature dropped to15 degrees, and by Saturday the Times notes “Green Lake is taking on a coating of ice sufficient to bear a man’s weight in safety.” But the kids of this neighborhood had by then already been skating on the still unlined floor of the unfinished Green Lake Reservoir at 75th and 15th, which was covered with the six inches of trapped water frozen solid. Since the trolleys kept running throughout this cold snap the city schools stayed open, except for Broadway High School, which closed on Friday for want of fuel. The storm’s greatest worry was the city’s shrinking reservoirs. Residents were warned to stop running their water through the night or have the mains shut down. Above: Sited on the “edge” of Phinney Ridge in upper Fremont the Fitch-Nutt House looks west over Ballard to the Olympics. 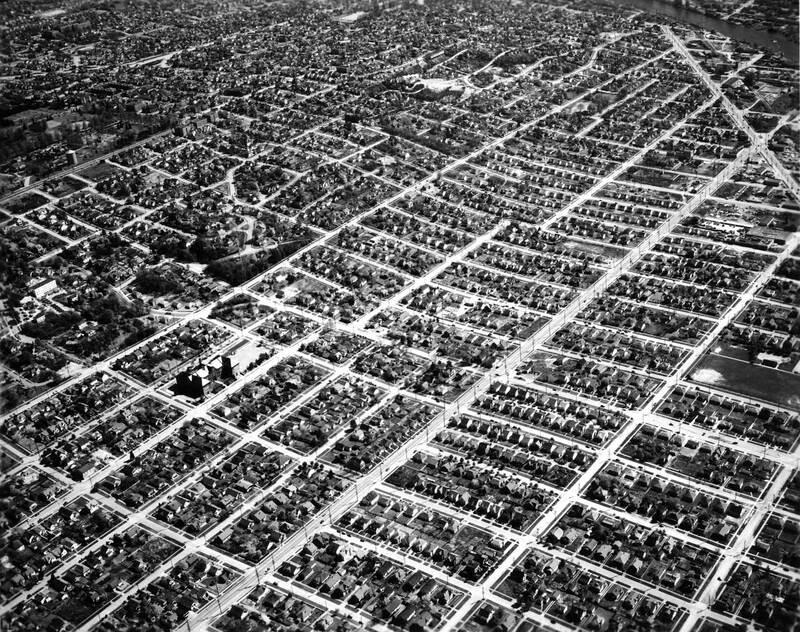 A Works Progress Administration photographer recorded this view of it in 1937 as part of the WPA’s late 1930’s survey of every taxable structure in King County. 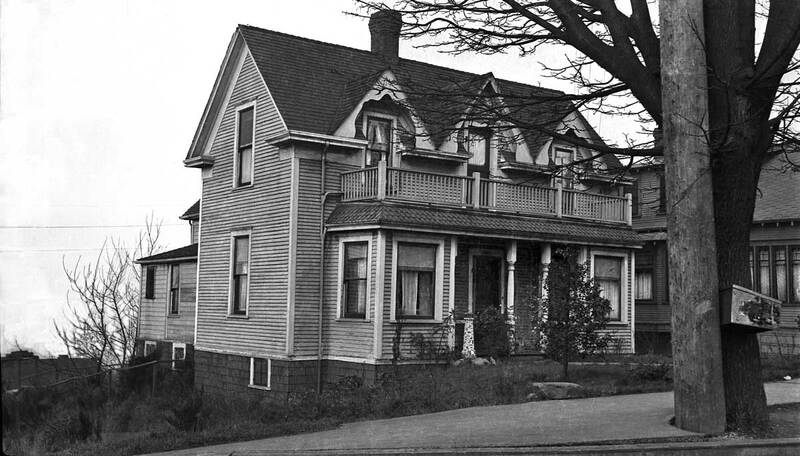 (Courtesy, Washington State Archive, Bellevue Community College Branch) Below: The now (in 2007) 105-year-old home survives with only a few superficial changes. This landmark Fremont Neighborhood residence at the northwest corner of Phinney Avenue North and North 44th Street will have its fate decided soon. 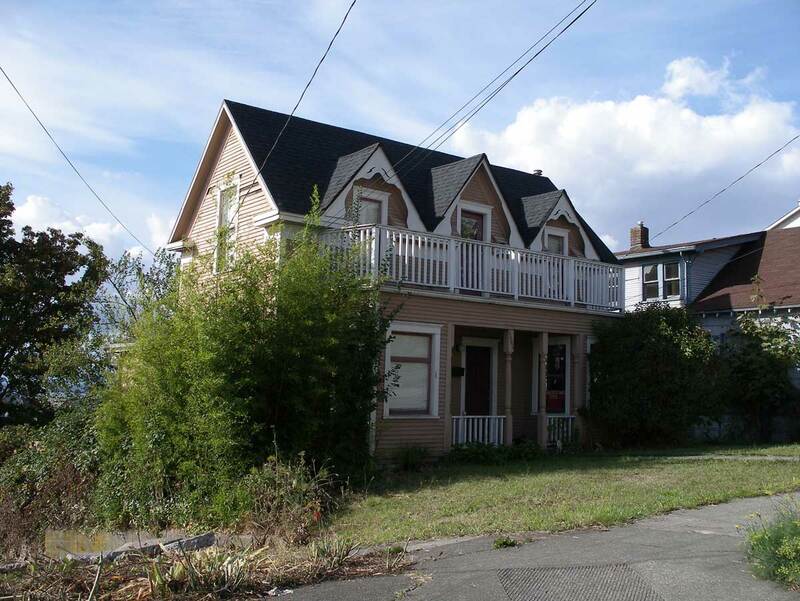 Should this rare “Vernacular Victorian” be rescued and restored as a local architectural treasure or should it be razed for more town houses? Called the Fitch/Nutt House, it is named for its first two builders. The carpenter Jackson D. Fitch was first, building the less adorned western side of the house soon after he purchased the corner in 1899. In 1902 Thomas W. Nutt followed, adding the distinctive one-and-one-half story front section with its trinity of gables or dormers and decorative bargeboards. 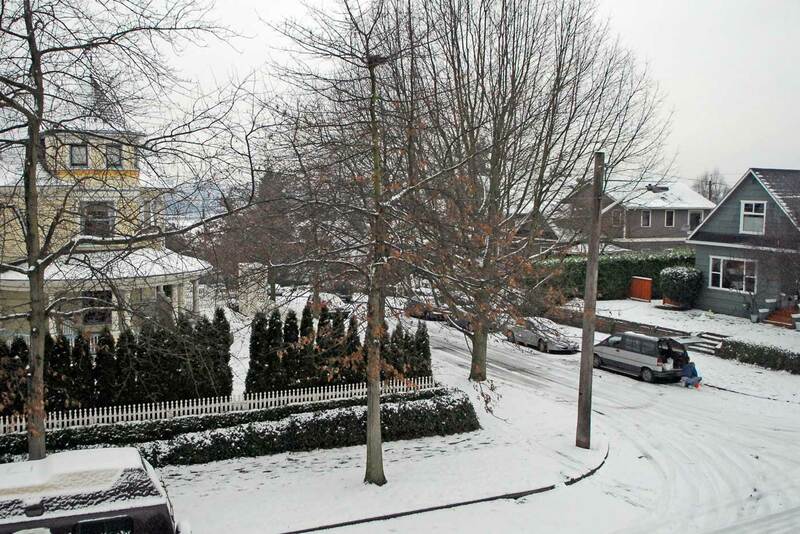 From its back looking west over Ballard and from its front watching the electric trolley’s that first rumbled by on Phinney Avenue in 1905, this working family home was ideally sited with sublime views of the Olympics and speedy connection to all parts of the then booming city. Local historian Greg Lange in his search for the homes in Seattle that were built in 1905 or earlier and still retain most of their original architectural integrity includes the Fitch-Nutt house in his “top 100” list. 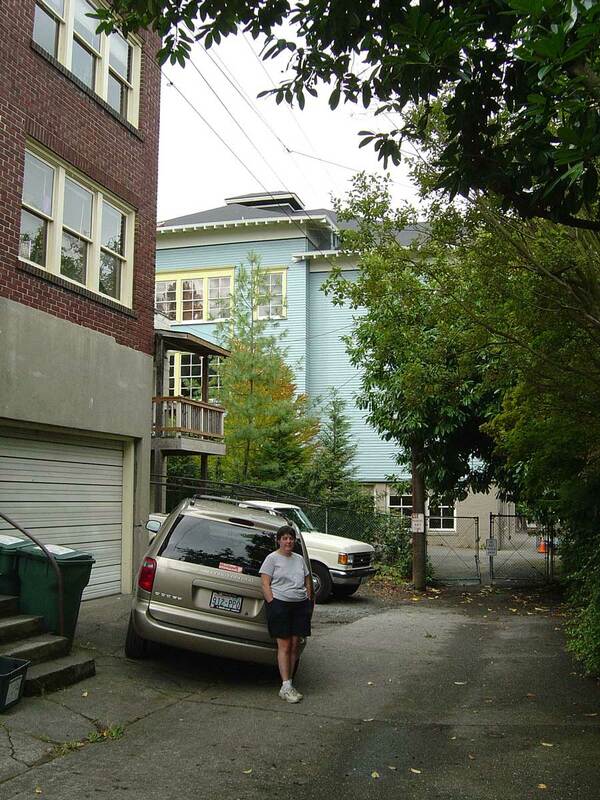 And now Paul Fellows and Carol Tobin, Fremont residents, have submitted this surviving feature of old Fremont to the Seattle Landmarks Preservation Board for protection. 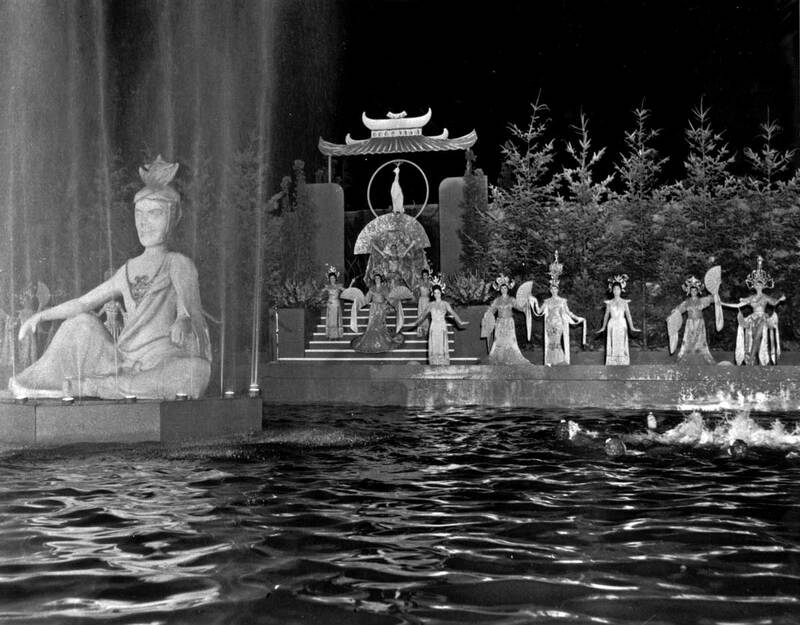 A few weeks past we featured the Green Lake Theatre photographed by Lennard LaVanway in 1947. 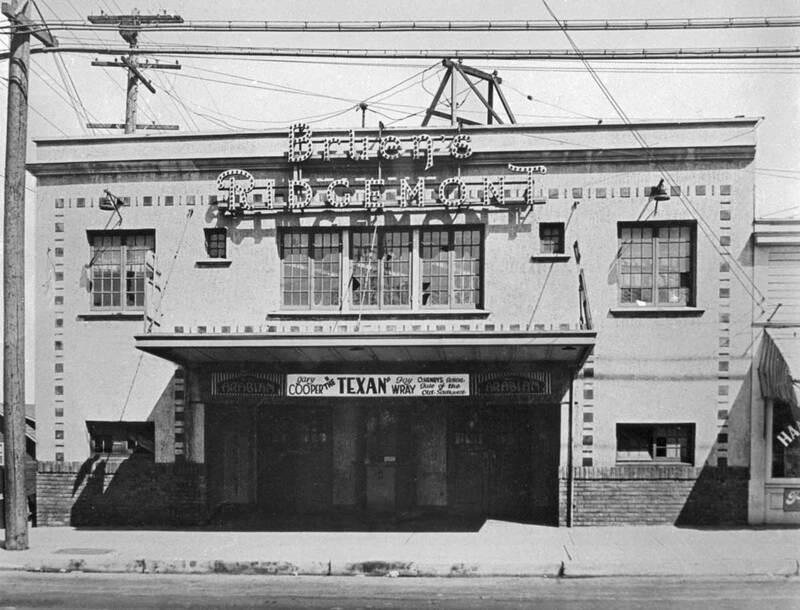 Here is LaVanway’s Ridgemont Theatre, and also from ’47. 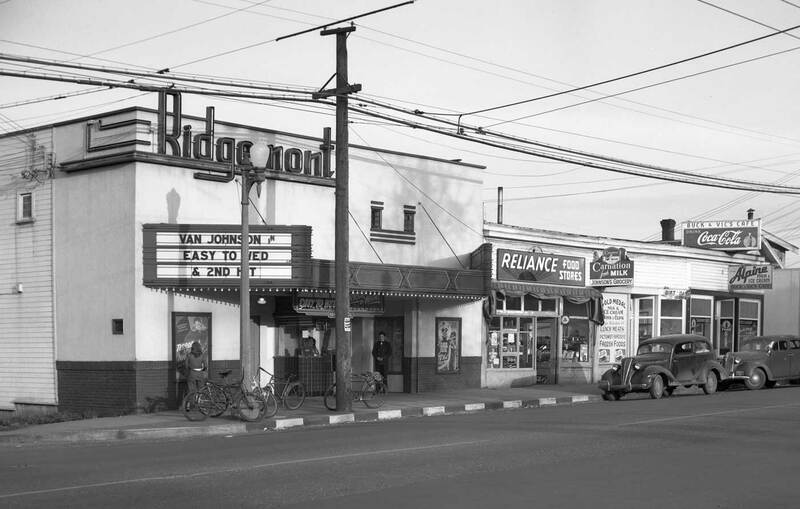 Many of the best film experiences of my prime in big dark rooms were had from its seats or from Selvidge’s other repertoire venue, the Edgemont in Edmonds. I thank him. Since most of these were foreign films with subtitles, the Ridgemont was considered by some a “communist front” and the lights of its marquee were at risk – pelted often with rocks, eggs and even excrement. That these experimental perils on Phinney Ridge were not always so is proven by the two films showing here – “Easy to Wed” a romantic comedy with Van Johnson, Esther Williams and Lucille Ball and “Terror by Night” a Sherlock Holmes thriller in which Basil Rathbone has to solve both a Rhodesian diamond theft and find a murderer among the passengers of a train running from London to Edinburgh. Easy to do for Sherlock. Rapping it now, thanks to local film historian David Jeffers for this terse summary of the Ridgemont’s long life. “It was a big box neighborhood theatre with 452 seats. Opened as Houghton’s 78th Theatre in 1919, Ridgemont in 1922, Bruen’s Ridgemont in 1928, remodeled twice, in 1938 and 1967.” Following seventy often adventurous years it closed in 1989. An earlier Ridgemont Facade and The Texan within.